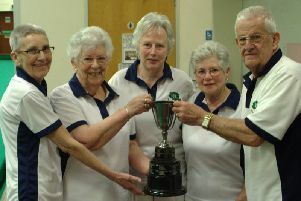 In their latest competition, 31 ladies took part in the President’s Vase event at the Clifton Road course. Peter Hawkins officiated at the start – seeing the ladies off on the first tee – and former Rugby Golf Club President, Barry Pegler, saw them back in and presented the prizes. Nearest the pin on the 5th was Sue Graham, and nearest the pin in two on the 9th was Di Reid. In third place overall was Helen Fleming with 39 stableford points. In second place was Sue Tura, with 40 points and in first place, receiving the President’s Vase, a magnificent cut glass crystal trophy, was Sue Graham with 41 stableford points.